There are two good mountain visits - both about one hours drive away from Camerons. Go up in a gondola up Aonach Mor - part of the Ben Nevis range. 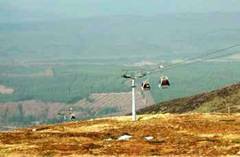 An all seasons attraction travelling in a gondola up 2150 ft beside Ben Nevis. There are mountain walks, restaurants, mountain biking and winter ski area. Ben Nevis is the highest mountain in the British Isles at 1344m [4408ft]. 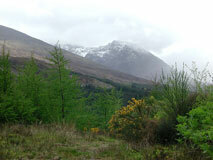 It rises steeply above Glen Nevis to the southeast of the bustling town of Fort William. It is classed as a Munro - the name given to mountains in Scotland over 914.4m [3000ft]. The list is frequently revised but currently 284 peaks are considered to be Munros. Collecting Munros - or 'Munro-bagging' by climbing them - is now a popular sport. Fort William lies at the start of both the Caledonian Canal and the ' Road to the Isles ' - which runs to Mallaig. This was once the main ferry port for services to the Outer Isles although now ferries operate from Oban. Journey up the Cairngorm Mountains on the funicular railway 9 miles from Aviemore. Leave Camerons and proceed to the A9. Travel down the A9 towards the busy village of Aviemore then turn off onto the B9152 signposted Aviemore - follow the B970 where Cairngorm Funicular Railway is signposted. Drive up the mountain road and buy a ticket for the railway. The Cairngorm Funicular is the country's highest and fastest mountain railway with panoramic views from the terrace of the Ptarmigan Restaurant at the top. There is a 'Shop at the Top' and a good informative mountain exhibition with film shows. Great fun watching the skiers...some good and some not so good. The loch at the bottom (Loch Morlich) is an ideal place for a picnic - tables provided. Also a good chance to see an eagle soaring over The Cairngorms - we saw one while we were having a picnic.